The Kimberley is Perth's northern-most region, with the Broome coastline of the 424,517 square kilometre region lying closer to south-east Asia than to the city of Perth. The Kimberley has been held in high regard internationally for its stunning natural landscapes (having been awarded places on both the World and National heritage lists) and unique biodiversity. The marine habitats of our far north, including those that make up the Kimberley region, have been identified as one of the few pristine coastal environments left on Earth; the others being the Arctic and Antarctic coastlines (Halpern et al., 2008). Covering one sixth of the state's total area, its immense and complex landscape contains spectacular gorges, waterfalls, cave systems, rainforests and an astonishing variety of wildlife. The sandstone gorges of the region are the stunning setting for some of Australia's oldest surviving rock art (petroglyphs and pictograms), including the Gwion Gwion (Bradshaw) and Wandjina styles. This land and its waters offer unparalleled insights into the dramatic Australian landscape, its native ecosystems, and the cultures and histories of the indigenous peoples. A 5 million hectare National Park, Australia's largest, is set to be created after a deal was struck banning all mining in the iconic Mitchell Plateau. No further mining or exploration will be allowed in the 175,000 hectare area which is part of the larger National Park. Rio Tinto had been exploring Mitchell Plateau for 40 years, but agreed to relinquish their leases back to the WA Government for Conservation purposes. In 2015 the state government came to an amicable decision with Rio Tinto regarding their mining rights in the region; resulting in the forfeit of these rights by Rio Tinto to the Western Australian Government. Rio Tinto chief executive Sam Walsh underlined the importance of such measures; remarking in an interview by the ABC that “you could not mine this area without impacting on the environmental and heritage aspects”, and noting "[the Kimberley region] is iconic. There's no question in my mind that this…needs to be preserved for future generations". Whilst such measures are an important first step; a national park does not necessarily preclude all mining, and nor does it safeguard the local environment and biodiversity. The 2017-2018 financial year saw unprecedented support from the state government, with initiatives introduced that focused on preserving biodiversity, and facilitating the growth and repair of this region; in-line with their 2011 Kimberly Science and Conservation Strategy (available here). These measures sought to prioritise, through funding, conservation and tourism; utilising local indigenous knowledge by promoting employment within land-management roles. The Tourism Council of WA released Marine Tour Operators Best Practice Standards, a report developed with the Department of Fisheries under the Kimberley Science & Conservation Strategy. The work aims to ensure the Kimberley tourism industry maintains the highest standards while protecting, preserving and presenting this untouched environment. The Greens (WA) support joint management of the conservation estate, incorporating the best of traditional and modern knowledge of the area. Whilst celebrating these achievements, The Greens WA understand the need for ongoing and pragmatic action to provide continued support to both our local communities and the land in which they are situated. The Great Kimberley Marine Park, is yet to be fully realised and considerable work lies ahead in regard to resource management in the Kimberley region; especially minerals, mining and natural gas deposits. The Greens (WA) are committed to protecting the region’s wilderness areas, coasts and rivers. We also believe in protecting the rights of all of its people and ensuring its Aboriginal communities are adequately resourced by government. Adequate funding to address environmental issues such as over-grazing, over-fishing, invasive species and bush fires. An increase in the management and ownership of sea and land conservation areas by Aboriginal groups. Liquid Natural Gas developments in the Kimberley region to be rejected if they lead to major local, state or national greenhouse impacts. The rejection of bauxite mining in the north Kimberley. The rejection of any new dams and large-scale land-clearing. A new WA Biodiversity Conservation Act leading to a statutory regional conservation plan. Site any Browse basin gas developments on either off-shore floating platforms or south of Broome including the Pilbara (excluding the Burrup or Barrow Island) in areas preferably with existing industrial infrastructure. 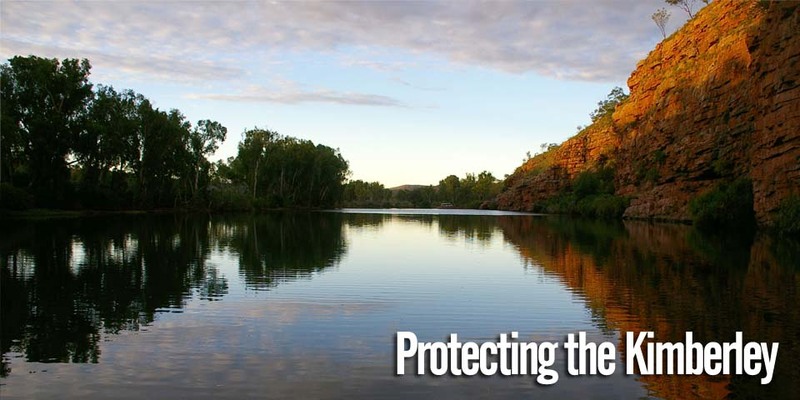 Declare a representative marine parks system in the Kimberley region. Keep waterways healthy and restore degraded aquatic areas. Manage new conservation reserves and ‘off-reserve’ areas for conservation. Promote land use and economic models compatible with the natural values of the region. Increase funding to programs such as Aboriginal rangers. Provide stewardship payments to pastoralists who conserve ecosystems through practises such as fire, weed and feral animal management. Ensure that profits and the development of tourism and recreational fishing contribute to Aboriginal economy and management. Find a just resolution to the requests for compensation for ill-health suffered by Kimberley herbicide workers.